This collection of the life work of Vermont poet Leland Kinsey, whom Edward Hoagland called “the genuine article,” ranges from the author’s home in the rugged mountains of northern Vermont to the towering stone lighthouses and highland shielings of his ancestors’ Scotland. 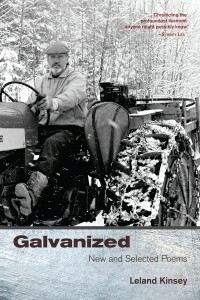 Appropriately titled Galvanized, this collection draws from seven previous, acclaimed works, as well as containing thirteen new poems. Kinsey takes readers on travels to the brawling rivers of Labrador, the slopes of Kilimanjaro, the wheat fields and dinosaur digs of Alberta, and the ranchos of the Tex-Mex border. In language so exact and powerful it appears to be galvanized itself, Kinsey carries us deep into human history and the natural world that he knows so intimately. With him, we visit the rough, country ballfields and raw girlie shows of his youth and experience the fascinating intricacies of the variety of professions he has known. Kinsey is a poet of the “reaches of the world” and our place in it. He writes of work, love and loss, family and friendship, joy and sorrow. He writes with a hard-earned vision of hope, always straight from his own dauntless heart. >>>>>>> <<<<<<< Leland Kinsey grew up on a dairy farm in the Northeast Kingdom of Vermont, in the same area his Scottish ancestors settled in the early 1800s. He received his undergraduate degree from UVM and his M.A. from Syracuse University before returning to northern Vermont with his wife and children. In addition to his writing, Leland has worked as a farmhand, printer, logger, carpenter, and horse trainer and has taught a variety of courses at Elderhostel. He has conducted writing workshops for the Vermont Arts Council and the Children’s Literacy Foundation at over 100 schools in New Hampshire and Vermont. Six collections of his poetry have been published prior to this collection. 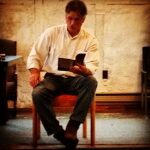 Author available for readings throughout New England. Distributed by Midpoint Trade Books, Ingram’s, Baker & Taylor.